The Fuji X-T1 Digital Camera Body is a highly responsive, sophisticated compact system camera with retro styling, SLR-style handling and a solid weather-resistant build. The X-T1 comes with the world's fastest Real Time EVF, a 16.3MP APS-C size X-Trans CMOS II sensor and powerful EXR Processor II, along with all of the benefits an X Series camera is renowned for, such as its ability to focus quickly (0.08 seconds) and capture sharp, detailed images. It also offers 1080p movie recording, an EF-X8 external flash unit and a 1.04million dot 3.0" tilting LCD screen. 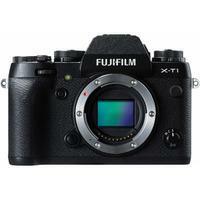 Fujifilm X -T1 with X - T1 Grip All Boxed ! !